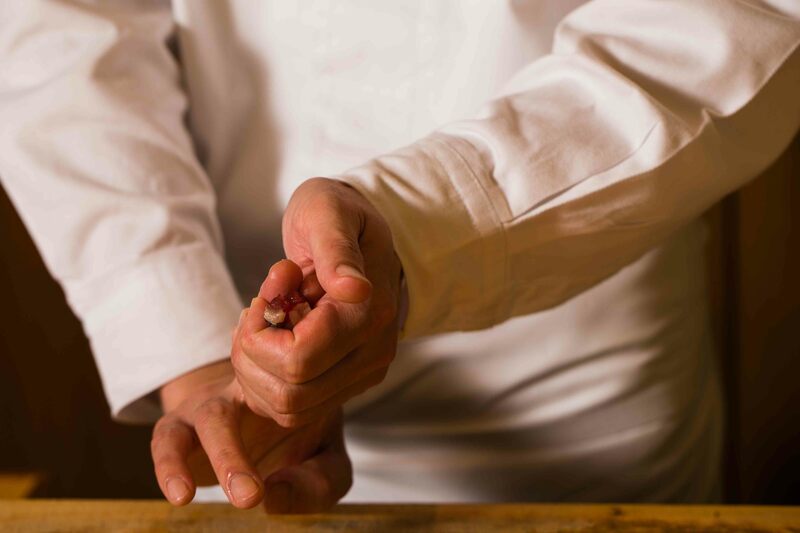 Ikko promises to take guests on a journey through a sushi story, with a young genius chef obsessive not only about his ingredients but about the progression of the meal that incorporates the best of Japan’s unbeatable seafood. Made possible through unbending passion and commitment to sushi, by a chef who knows both hardship and triumph, this is a sushi course in which the tension keeps building leaving guests wowed and totally satiated. The idyllic island of Hokkaido is well-known for its vast nature, but it also has the thriving city of Sapporo, which has its own busy entertainment district and a world-famous ramen lane in Susukino. 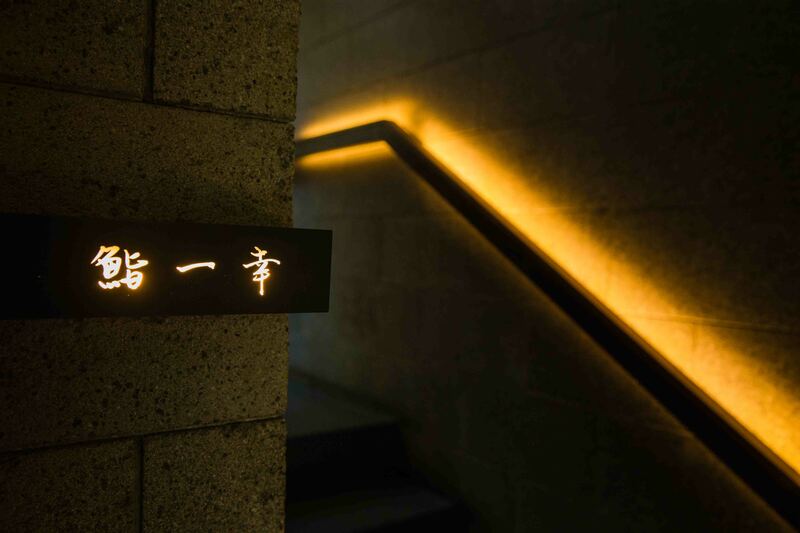 Here, tucked away on the second floor of a modern building is Ikko – an exclusive space that seats only seven. Completed in 2014, the stone entranceway is lit by the golden glow of a handrail beside a lattice wooden sliding door. Upon entering, your eyes are immediately drawn to the vast countertop, reminiscent of a stage for Noh classical Japanese drama. Made from three whole planks of hinoki Japanese cypress, the chef’s search for a restaurant space was sparked by his infatuation with this enormous timber. 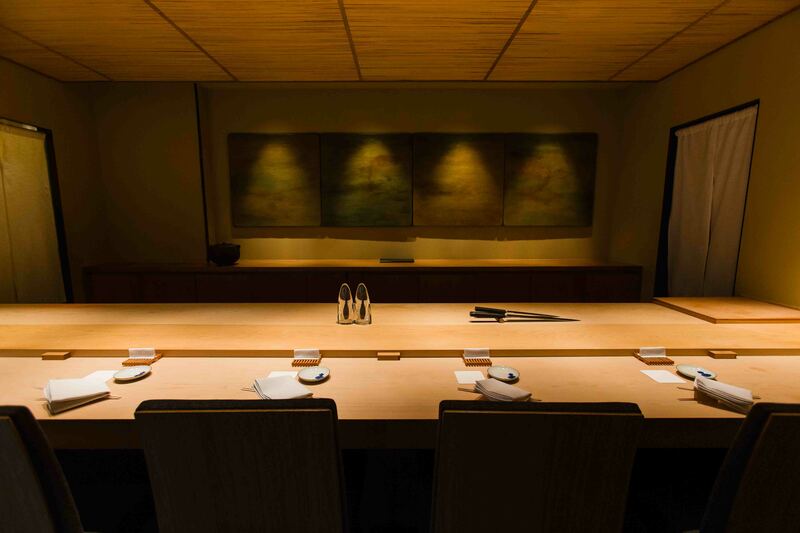 The space is by no means large, and yet somehow Ikko has a luxurious feel. Expectation builds as you take your seat within the hushed calm…let the show begin. Enjoy a journey through a sushi story. Chef Kudo is fixated on the meal being a progression, with neither a single dish that shines more than another, nor a journey through ebbs and flows. He wants to be evaluated on the meal as a whole, each dish stronger than the last, building to a crescendo that takes the guests' breath away. 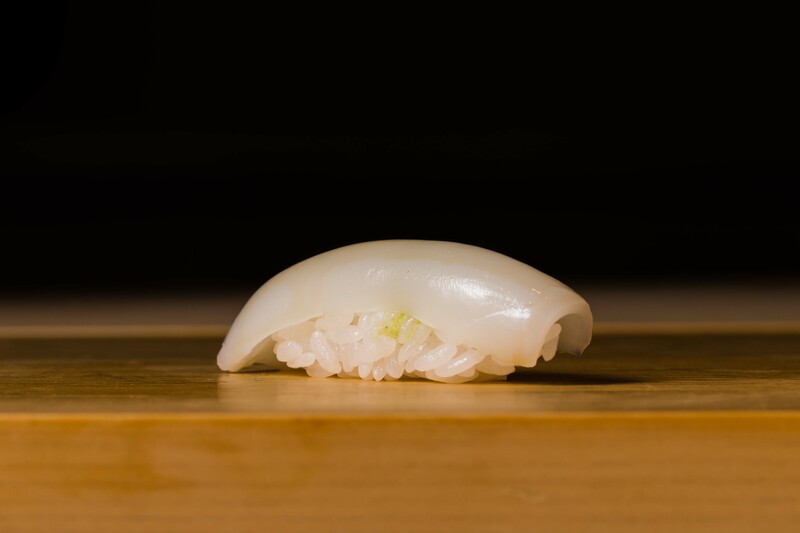 Balancing the flow with nigiri and tsumami small plates, Kudo feels very strongly that tsumami plates set the stage for the nigiri that follow. He sees himself not as a chef, but as a craftsman, whose role is to maximize the full flavor potential of every ingredient, and as such, he is constantly experimenting with flavors and combinations. He knows his ingredients intimately and uses that knowledge to plan the story of his progression. 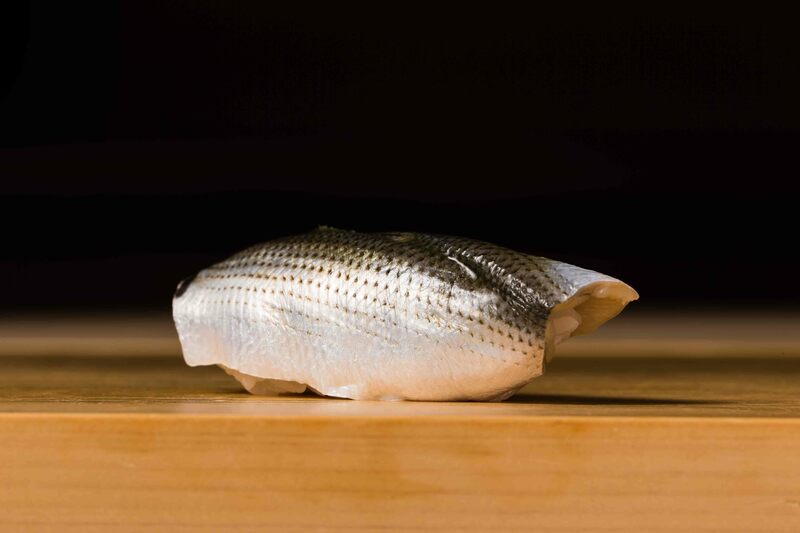 For example, maguro tuna from Oma in Aomori prefecture feed on horse mackerel in the summer, but squid in autumn, resulting in quite different flavors. Bonito (skipjack tuna) also feeds on horse mackerel around this time. Kudo’s conviction is that the course should follow these patterns of nature, thus he serves bonito, horse mackerel and tuna in that order. 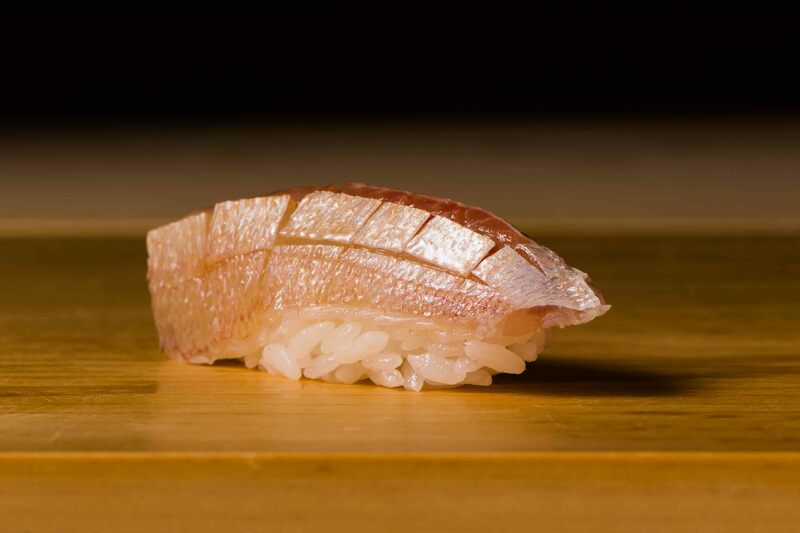 Nigiri morsels also include sea bream fingerling from Kagoshima with glistening pink skin, and golden cuttlefish from Akashi on the Seto Inland Sea. 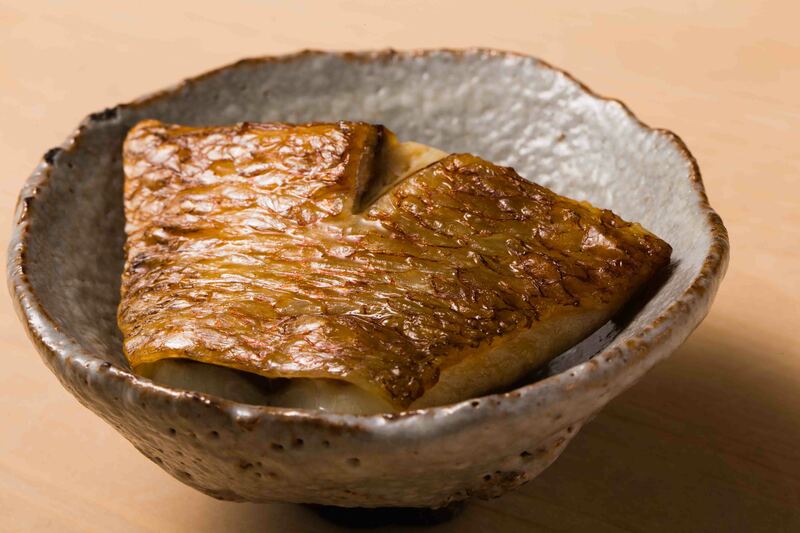 The heady aromas of charcoal-seared bonito – a rare variety from the Japan Sea – with a dab of seaweed soy sauce is followed by the buttery texture of charcoal-grilled black-throated seaperch from Tosa, Kochi Prefecture. 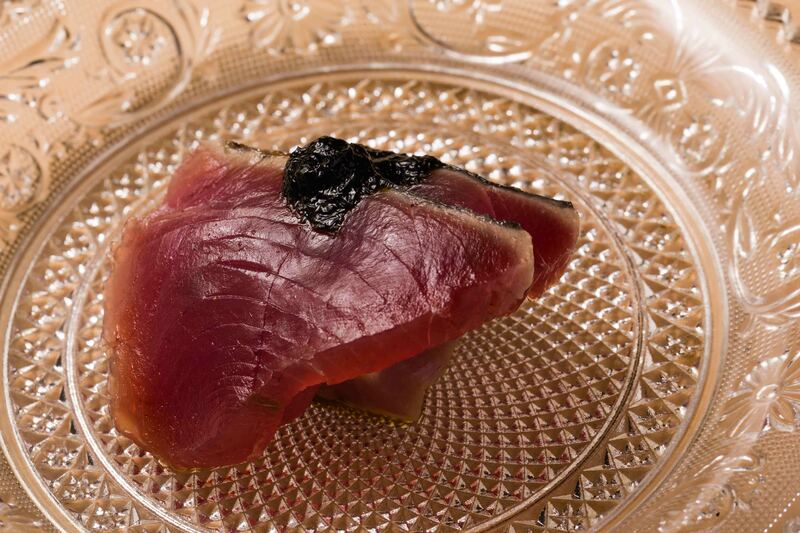 The silver skin of Kohada gizzard shad is contrasted with the deep pink of chutoro flesh from a 130-kilogram tuna, and then the delicacy that is fatty tuna. 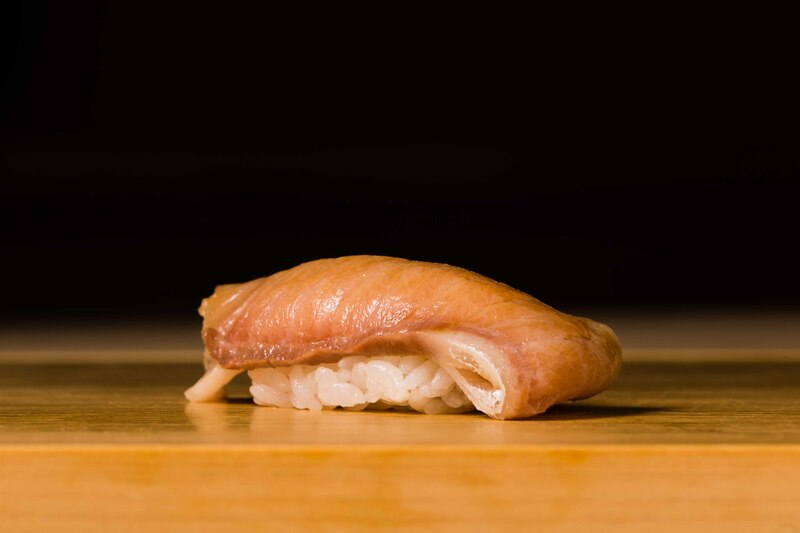 A generous slice of marinated yellowtail is folded in layers, too big to rest atop the oval of rice. 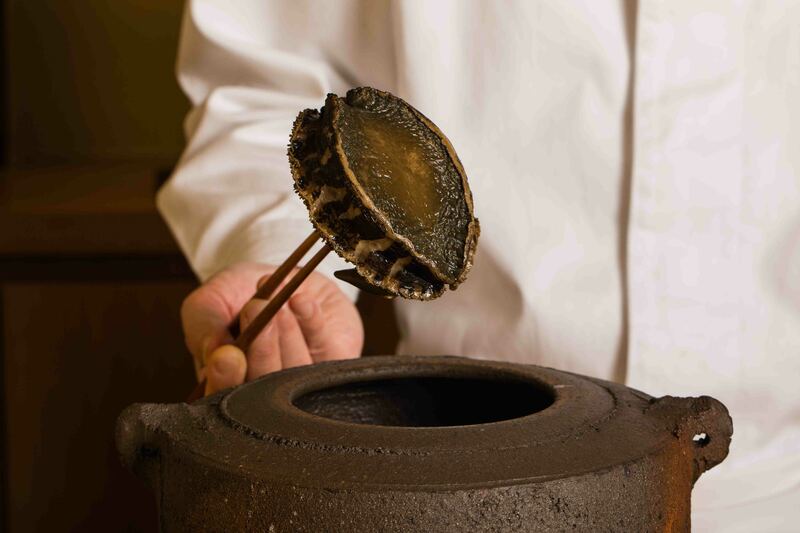 And for the climax, you will be treated to a combination of some incredible seasonal ingredients such as an aromatic mix of luxurious matsutake mushrooms and fatty tuna. Kudo spends an exorbitant amount of time procuring ingredients. For seafood, he physically boards the boat with fishermen to see where the fish are caught, not satisfied with just hearing where they came from. And he does not limit himself to Hokkaido ingredients. Rather, he finds the best from all over Japan. Tsukiji fish market in Tokyo accounts for about half of his supplies, supplemented by catches direct from fishermen and produce direct from farmers, with the remainder coming from Kyoto. Repeated visits to Kyoto and getting to know the providores means he now has access to some items that are not on the front shelves, procuring quality ingredients from their secret stash. Chef Junya Kudo is a second-generation sushi craftsman whose earliest memories include helping at his father’s restaurant. With sushi deeply embedded in his DNA, he had no qualms and never questioned training under his father to one day take over the restaurant. He became an apprentice after graduating from high school, and already started forming the images of how one day he might do things differently. At just 22, when his father fell ill, he found himself in charge of the daily running of the restaurant, and from 25, it was totally in his hands. Running a sushi restaurant in Sapporo, a town known for deliciously fresh seafood, was not easy. Kudo thanks the locals and their takeout orders for keeping the restaurant afloat. Despite being the featured sushi craftsman in a major Japanese television documentary and subsequently earning two Michelin stars, Kudo only considers his big break as coming in the last one or two years. Having said that, Kudo wouldn’t change how it has all happened. The experiences keep him modest and the struggle has shown him that perseverance against the odds and risking failure pay off. Kudo is ambitious, enterprising, and always searching for the best way to the customer’s taste buds and heart. He is obsessed with perfection and some even call him a young savant. He just thinks of himself as another member of a four-person family that works together to run a sushi restaurant in Sapporo, while at the same time feeling a deep responsibility to support that family. Under a great deal of pressure, Kudo has found huge success, and we can all enjoy the fruits of his hard work. 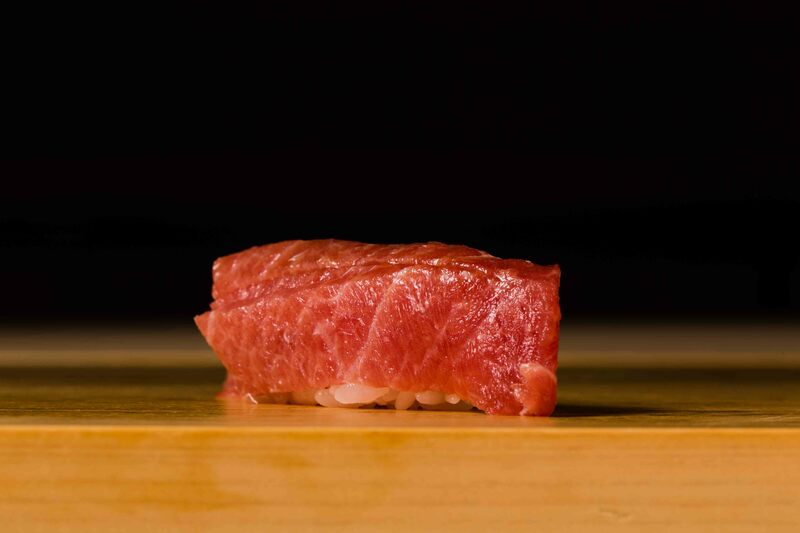 The pursuit of refined simplicity is Kudo’s ultimate goal. 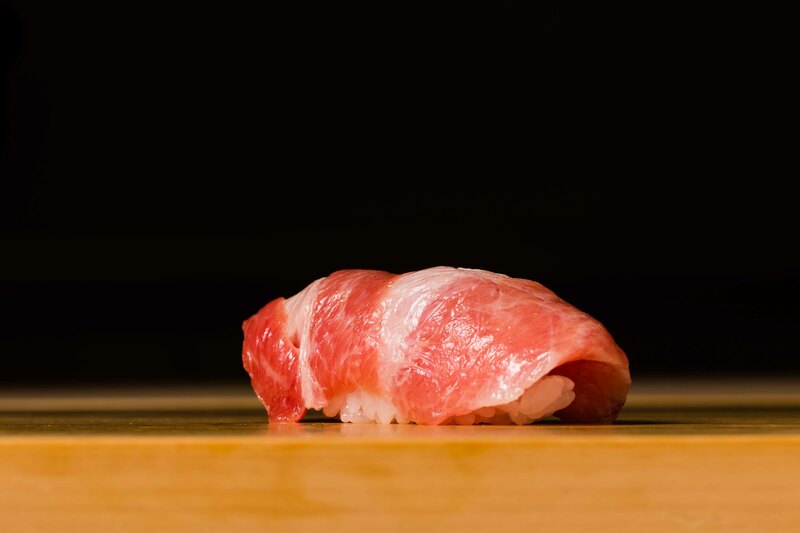 It is something he believes people from around the world can appreciate and hopes it will bring many to Sapporo to enjoy his sushi. He believes exposure to many different things allows you to then refine your own skills and find new depth that is not possible without those experiences. Thus, Kudo is always searching for new challenges and ways to expand his potential, seeing his youth as an enormous asset. And because Kudo he has an eye to opening new spaces, perhaps in Tokyo or even overseas, someday people may even be able to find his sushi a little closer to home. 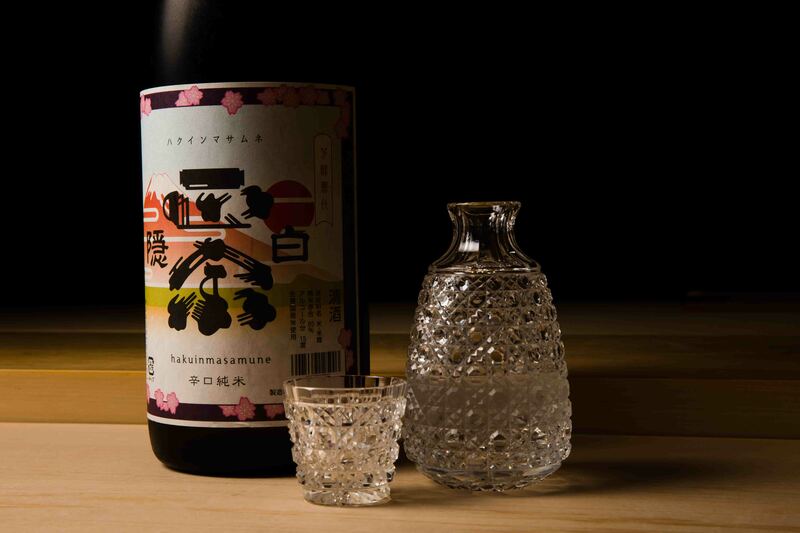 The restaurant carries an impressive array of sake to be paired with the sushi, carefully selecting varieties that enhance the sushi without interfering with the innate flavors. 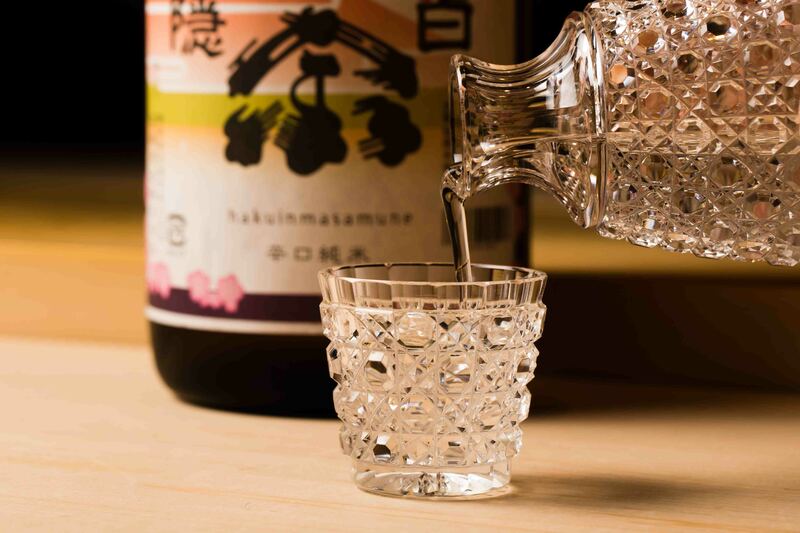 Aiming for sake varieties that have a sustained aftertaste, help maintain the seafood aromas, and enrich the taste of each morsel is no easy task. But the dedication to that process is so serious that Kudo has employed a specialist sake sommelier. Together they discuss the day’s catch and menu and decide the perfect accompaniments for each dish, and the ideal timing to heighten the customer experience. 2 seating times: from 6PM and from 8:30PM.